There are many different types of Calligraphy and Penny has taught most of them. 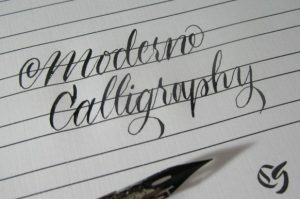 Spring term is going to be a continuation of POINTED PEN CALLIGRAPHY. You create Pointed Pen Calligraphy with pointy nibs and those nibs result in letters that have elegant, subtle stroke contrast. Penholders: a regular one works fine, but an oblique holder is my preference – this is the holder with a ‘sidecar’ which is very helpful if you are a fan of very sloping writing. Ink: walnut ink works well; if you are using an oblique holder you will need a small container to hold the ink as the ‘sidecar’ won’t fit into most ink bottles. 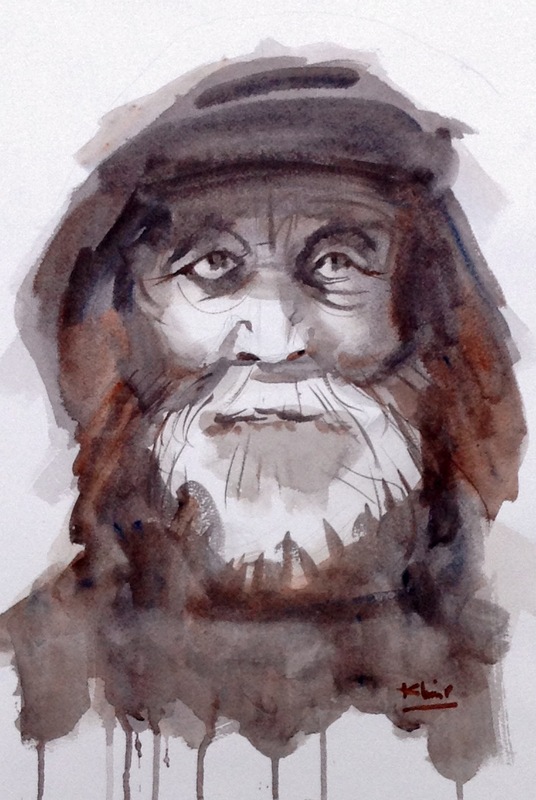 Paper: Layout paper works very well – you can see through it to trace the letters initially which is very helpful. 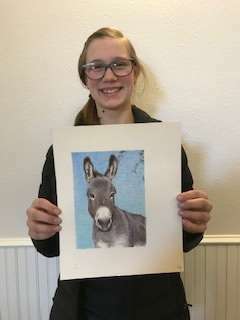 Taught by accomplished colored pencil artists. 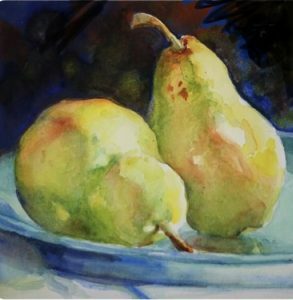 Our featured instructors for Spring Term include Pat Averill and Colored Pencil students who have favorite techniques, tools, tricks and art specialities. This will be a term filled with lots of new ideas and lots of learning. 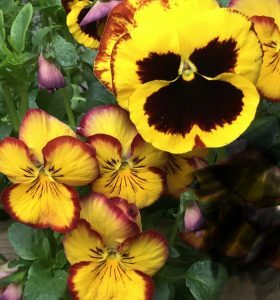 This class has been ongoing for a number of years and is welcome to beginners through advanced students. If you can sharpen a pencil, push it around on paper and love color, you are qualified to attend. 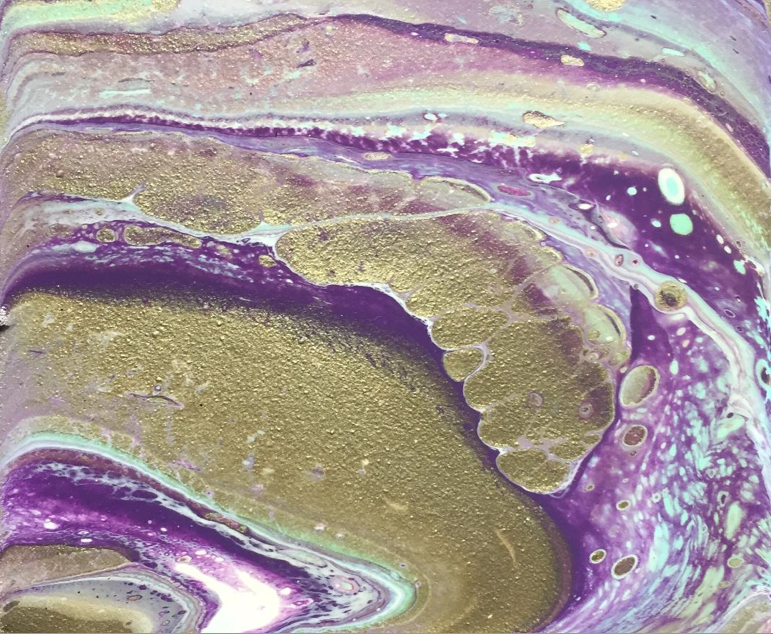 This four-part series of classes will cover the basic techniques involved in Acrylic Pouring. 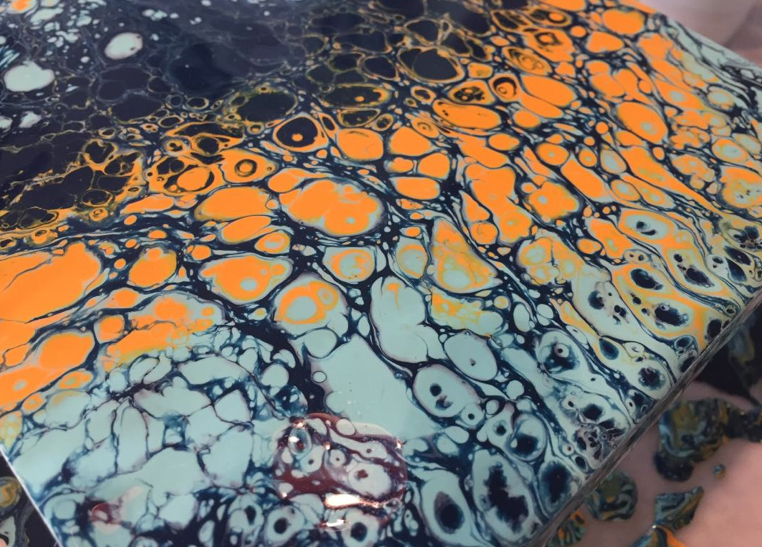 Acrylic pouring can also be called fluid painting or fluid art, and involves pouring paint onto a canvas or other surface to create an abstract piece of art. 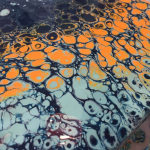 Students will learn some basic color theory, how to choose and mix paints, as well as the four most common types of pour, as well as how to seal/finish completed projects. A small (between 5×5 and 8×10) pre-stretched and primed canvas (not canvas boards as these warp easily) OR gesso board/wood panel. Smaller really is better. A baking sheet with rimmed edges or an aluminum oven-liner. Length: Each class will be approximately 1 hour long. Students will need to take their wet paintings home to dry after each class. 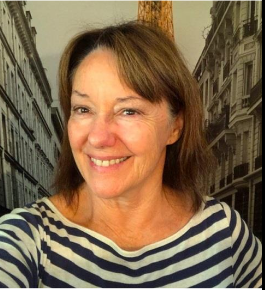 May 9 –“PAINTING with INTENTION…RE-WRITING YOUR STORY for HEALTH and HAPPINESS!” taught by JAN JORGENSEN. Join Intentional Creativity Painting Instructor Jan Jorgensen of Olympia, for a rich day of Expressive painting that will allow you to move through a “Personal intention”for your Happiness and Well-Being. We begin with your own “statement” written on your canvas and then move through 13 steps of color and image enabling you to re-write your personal story. It’s creative, cathartic and magical all at once. No painting experience required and you will have a very meaningful art piece to take home and embellish. Please be set up and ready for instruction at 10am. 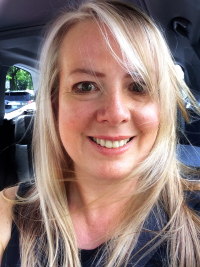 About the instructor: Jan Jorgensen is a seasoned workshop facilitator for personal empowerment through the arts with a focus on Women finding their Voice. $55 includes: paints, brushes and a 16”x 20” canvas. Please bring a water spray bottle, black sharpie. Sketch pad or journal. Glitter if you desire. $55 for the day.Thursday 10am–4pm. One hour lunch break. 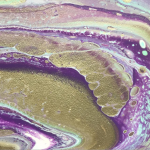 Learn how to manipulate this flexible and gorgeous medium while creating a lovely painting that takes advantage of the properties which are unique to watercolor on a prepared surface called “claybord” or “aquabord.” These surfaces come flat or attached to a cradled board. These prepared surfaces respond differently than the WC paper we’re used to, providing some challenges and some advantages. Angie will have a limited supply of these surfaces for sale or bring your own. Project idea to go onto the boards are provided by the instructor or bring your own to fit either 8×8 or 10×10 inch surface. Step-by-step instruction as well as many demonstrations given. Angie brings lots of handouts to support instruction as well. 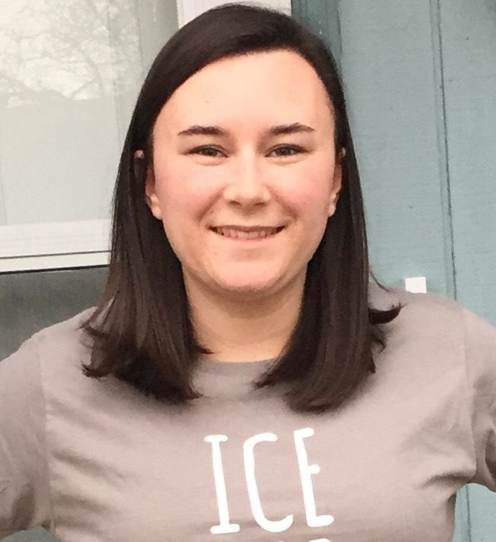 While class begins with helpful instruction, the bulk of class time is devoted to students actually putting into practice the skills they are learning and getting individual help when needed. All levels welcome. Lessons are designed with your success and joy in the process in mind. 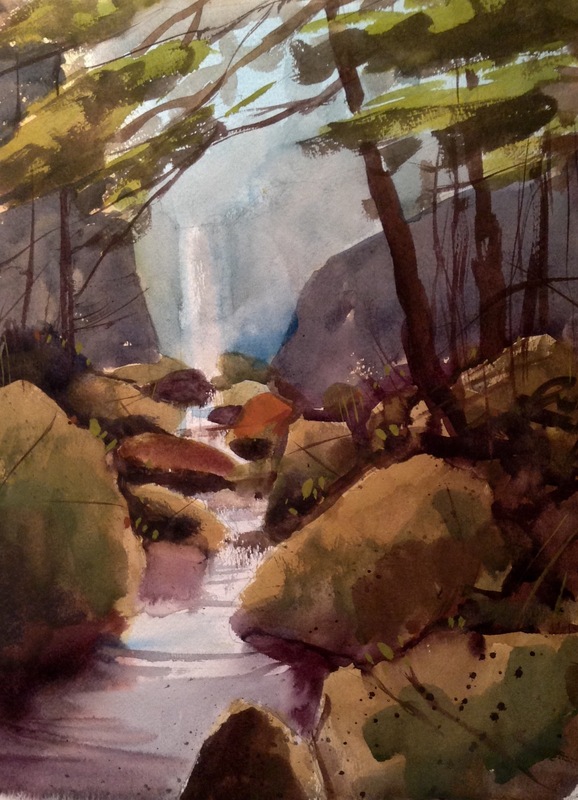 Instructor brings professional paints for use in class as well as other supplies. 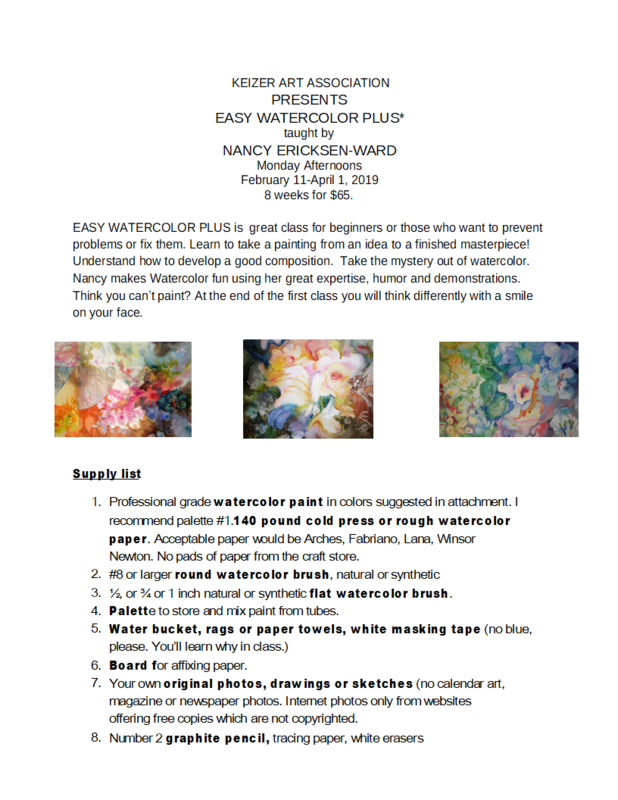 $5 materials fee if you bring your own Aquabord. 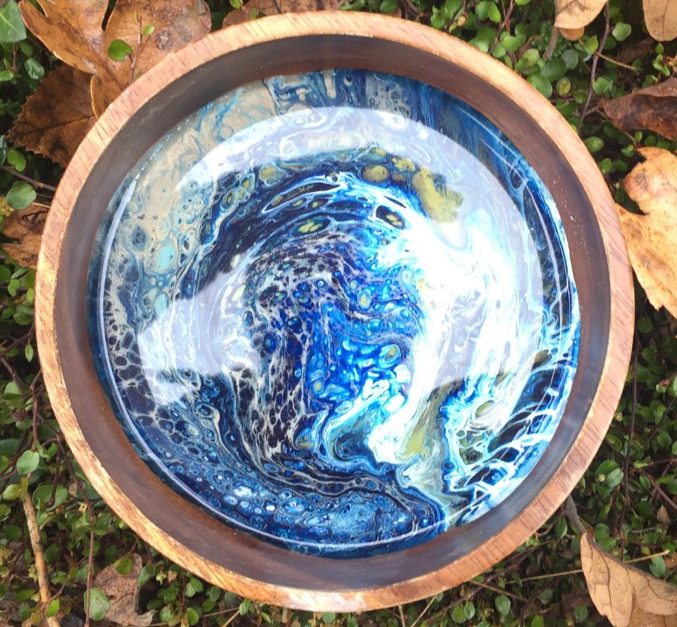 $12 more for 8×8 aquabord. $15 more for 10×10 aquabord. Students bring brushes. Flat synthetic hair brushes like you would use in acrylic painting won’t give you a satisfying experience. Angie brings brushes to class that you can try to see what you like before buying your own, if you don’t have brushes. Drawing Materials List -Drawing board and clips -Portable Sketch book -Large newsprint pad (12×16” min) -Kneaded eraser -Medium hardness charcoal -Artist quality drawing pencils, 6b -Razor blade and sandpaper for sharpening -Selection of good quality watercolor brushes Watercolor Colors -Kleenex -Palette or tray-Water container and spray bottles -Sponge or dishcloth -Photos for reference. March 15, 22, 29, April 5, 12, 19, 26 FRIDAY OPEN STUDIO. This “no host” studio is for artists of all mediums. Spend the afternoon in our brightly lit classroom with the benefit of good company and a pleasant place to work. Make a cup of coffee or tea and enjoy our extensive Lending Library and the Enid Joy Mount Gallery for inspiration. Open 1:00-4:00pm every Friday. Free to members. $3/day or $10/ month for non- members. No registration required. 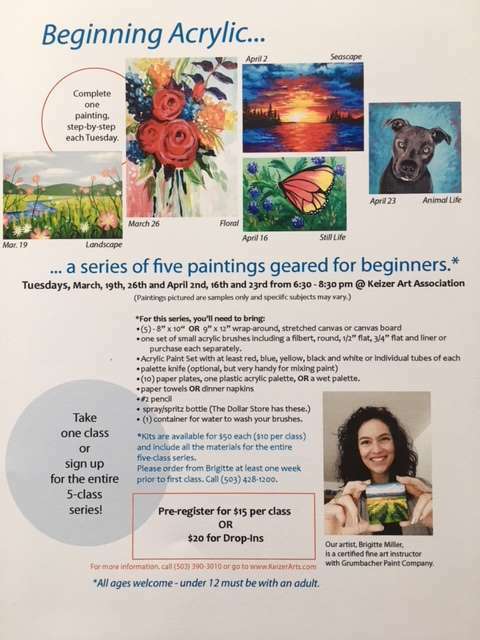 Please sign up at least one week ahead for these classes so the instructor can prepare for the correct number of students. 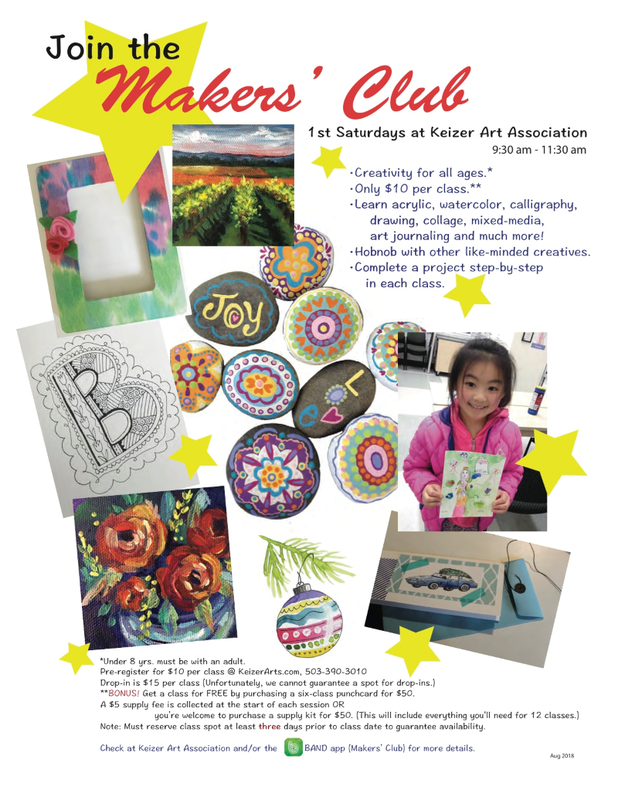 Ages 14 and above can register for adult classes. Refunds will be given to students if a class is cancelled. If a student registers and pays for a class and cannot attend we will gladly forward your payment to a future class. OTHER OFFERINGS: LENDING LIBRARY-Free to members. 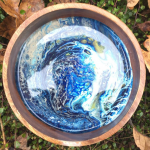 GIFT GALLERY- Browse our beautiful “Gallery K” for jewelry, cards, paintings, woodwork, tiles, scarves, books, bowls, fused glass, collage, and specialty art items. Gallery K is constantly changing and adding affordable gift items. Gift wrapping available. 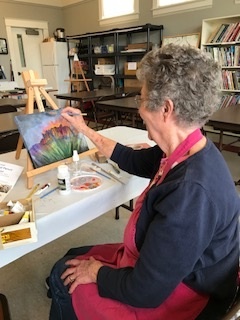 KEIZER ART ASSOCIATION and ENID JOY MOUNT GALLERY are located in the Keizer Heritage Center at 980 Chemawa Rd., Keizer, OR 97303. Ph (503) 390-3010. For further class information please call Carol Harris at (503)363-5667 or (503) 580-5476. E-MAIL: keizerartassociation@gmail.com WEBSITE: http://keizerarts.com. Check us out online and register online using PayPal or stop by the gallery to register. GALLERY HOURS: TUE, WED, THU, FRI 1:00-4:00, SAT. 10:00-4:00 pm. KAA accepts cash, checks, VISA/ Mastercard. Students and Instructors: take your supply list to The Art Department in downtown Salem and receive a discount on Art Supplies.